I got a 2nd hand Lite-Brite panel with a bunch of missing pegs. My dad being an Engineer in Fremont back in the 80’s, got some photocopies and used the green draftsman stencils to make me new drawings to color in. I didn’t realize at the time it would take him at least an hour to make those drawings while I would be done with it in 5 to 10 minutes. Beautiful artwork [Lalya] with the beads. This definately calls for old school bubble “http://en.wikipedia.org/wiki/Keyboard_technology#Membrane_keyboard” switch. I’m thinking maybe there might be a way to have the buttons have more life and have more flex without coming apart. Maybe something like small pieces of a ball point pen holding it above the membrane AND a one or two on the sides so it doesn’t fall out? Ugh. cut “small pieces of a ball point pen *spring* ” I meant. Uhm, a whole arduino? 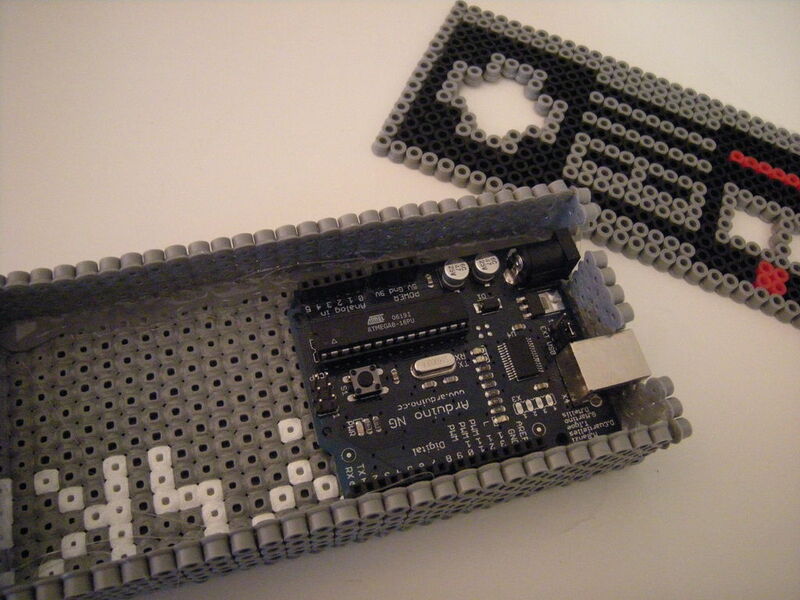 This is kinda wasteful..
Great idea for a project case! Neat but wondering how durable the case will be; the creations my kids make with these beads fall apart quite easily with a little rough handling. I never considered the possibility of using these beads for a case, but I like the idea. Opens up the door to all manner of artsy case designs.